Graduated from Kwansei Gakuin University. Involved in planning sales promotion events at an advertising agency. Currently practicing Japanese dance. Approved for “The Model Projects of The Machiya Machizukuri Fund”. Received “CB (Community Business)・CSO (Civil Society Organization) Award for Encouragement”. 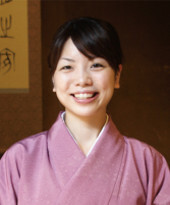 The gallery owner is appointed as a committee member in Kyoto for “the National Cultural Festival in Kyoto 2011”. Developing other advertising businesses including design, event planning, photography and publishing.